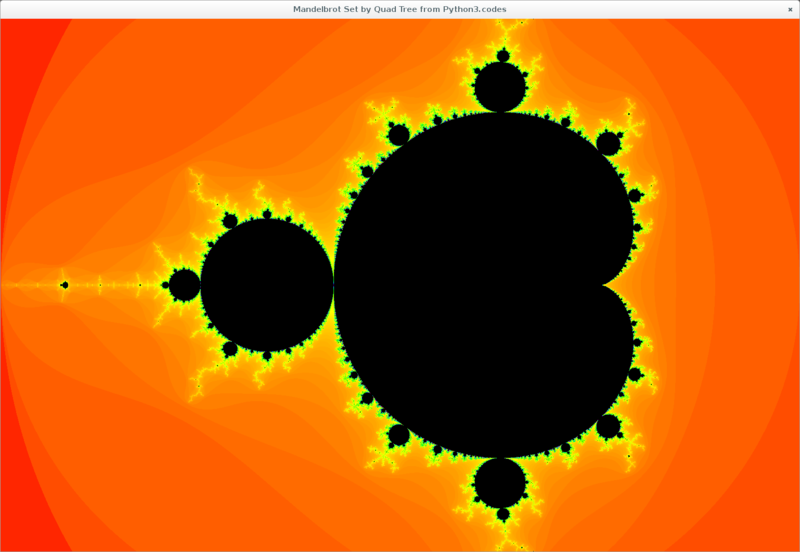 Most Mandelbrot Set programs proceed along the display area, pixel by pixel horizontally, row by row from top to bottom. This one doesn’t. It divides up the screen into 6 horizontal squares in 2 rows, then for each one, checks the value of the escape time for the pixel at each corner. If they’re all the same then probably there’s nothing happening in this square, so go on to the next one. Otherwise sub-divide it into 4 new squares and check them the same way. The assumption that if the square’s corners all have the same iteration count from the escape function then there’s no internal detail to render is almost always OK, but I’ve seen it break down in rare cases. It can happen that the M-set sneaks in bit from one or more sides. This is (almost) fixed by adding 4 more checks, each at the sides’ mid points. I think that my technique is called ‘quad tree’ (QT) in computer sciencese. The QT algorithm consist of subdividing an area (square in my case) into 4 equal sub-squares, and then processing and evaluating them somehow, before potentially repeating the process recursively on each sub-square, if necessary. Except that recursion wasn’t ideal as it’s depth-first and I wanted breadth-first so that the image revealed top-down. So I used a FIFO queue instead. There’s another version over at FractalArt.Gallery that does a couple more things: it plays fractal music from the M-set, and it does ‘art’, not entirely unlike Mondrian’s paintings (so I call it Mandrian). #           Get iteration counts at 4 corners. #               just shrink the square exposing colour behind!